John Timothy Arnett, known as Tim, (at Hymers from 1942 – 1949) died on 15th January 2017. “Tim grew up in Hull and was a pupil at Hymers in the forties. His parents and later his brother owned and ran Arnett’s Bakery which had several branches in the area. He left school and did a short spell in the Army before applying for the Royal Navy. He was trained as a pilot in the Fleet Air Arm at RAF Valley, Anglesey and flew fixed wing planes, stationed for some time on the aircraft carrier Ark Royal. He later said he never expected to survive this as landing planes on the deck was a risky business and many pilots were lost when the five attempts they had to land in time failed. He married Kim in 1961 and took a job with Bristow’s Helicopters which took him to India where I was born. He was issued with the first helicopter pilot license issued in India and saw much of the country from the air. In late 1964 he returned to England and settled in Surrey, setting up a printing company with a colleague he’d met in India. It later became Croydon Printing Company and had around 300 employees. Tim’s appetite for sailing, forged in the Navy, led him to buy a yacht which he moored in Brighton Marina. After his divorce he sailed across the Atlantic intending to sail around the world. He never got further than the Caribbean however, spending twenty five years in Sint Maarten and then the Dominican Republic. He lived on his yacht initially in Sint Maarten and sailed between the islands. This part of his life he often referred back to. He later settled in the Zona Colonial in the Unesco listed capital of the Dominican Republic, Santo Domingo and ran an internet cafe from his home. In late 2010 he returned to England and lived first in Leicester and then in Woodmansterne in Surrey, the village where we had lived in the late sixties and early seventies. He lived at the Royal Alfred Seafarers Society towards the end of his life who gave him wonderful support. 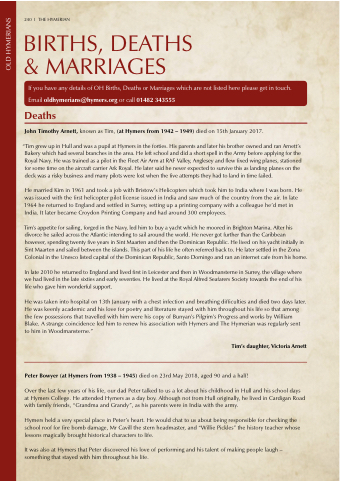 Peter Bowyer (at Hymers from 1938 – 1945) died on 23rd May 2018, aged 90 and a half! Over the last few years of his life, our dad Peter talked to us a lot about his childhood in Hull and his school days at Hymers College. He attended Hymers as a day boy. Although not from Hull originally, he lived in Cardigan Road with family friends, “Grandma and Grandy”, as his parents were in India with the army. Hymers held a very special place in Peter’s heart. He would chat to us about being responsible for checking the school roof for fire bomb damage, Mr Cavill the stern headmaster, and “Willie Pickles” the history teacher whose lessons magically brought historical characters to life. It was also at Hymers that Peter discovered his love of performing and his talent of making people laugh – something that stayed with him throughout his life.